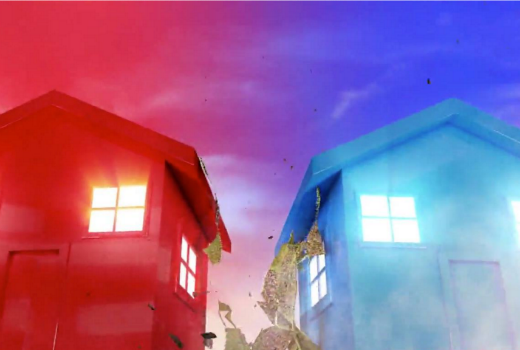 Nine is removing Reno Rumble from its 7:30pm timeslot next week, following a dismal first week. Next week Married at First Sight will screen at 7:30pm Monday 4 and Tuesday 5 April, followed by Reno Rumble at 8:50pm and 8:40pm respectively. It could also be the first time an M rated show airs at 7:30pm, under new classification rules. It’s also one night less a week, but given the return of ratings Nine has been practical in adjusting its schedule. If Nine can minimise the damage from Reno Rumble to Easter non-ratings, it will fare better in its annual share than continuing it at 7:30pm. On Wednesday night Nine has double eps of The Big Bang Theory from 7:30pm with Footy Show in Sydney / Brisbane and doco The Secret Life of The Zoo elsewhere. so if the reveals are moving to Monday night does that mean one night is reveal and one night is the weeks reno??. If it has no value to nine anymore why not just move it to Gem or Go and let it play out in full?? ABC played an M-rated episode of Fool Us at 19:30 on Saturday the 19th. So happy to see this fail. With the non-sense of “non-ratings” though wouldn’t it have made some sense for Nine to cut their losses and get as many episodes out this week as possible to minimise the number shown in the ratings season. They definitely need to move Reno Rumble given is poor ratings however putting Married at First Sight on at 7.30pm is not the answer. This move is likely to jeopardise ratings for it would otherwise achieve. Its the type of show you would watch after the kids have gone to bed, not while you are getting them ready for bed. Did it occur to you that many people don’t have children and those that do don’t all put their kids to bed at the same time you do? I think it’s strange that it should be expected a network would arrange their schedule around the assumption that every household is identical to yours. No I don’t expect every household to be like mine. Sleep deprivation due to young kids might impact the clarity of the point I was trying to make. Married at First Sight worked well last time in a later time slot so by changing its time might impact its success. For me it’s a guilty pleasure type of show that I would watch after work, dinner, dishes, putting kids to bed etc when I can just sit & veg without having to think too much. M rated viewing has aired quietly on a number of occasions particularly with shows on Eleven such a M rated episodes of New Girl and Rules of Engagement. As far as I’m concerned, children watching this show would find it disturbing with contestants throwing insults. I can never quite understand why they bother to classify shows PG,G, M, on Foxtel Selling Houses Australia is classified PG why it’s harmless,shows I have seen as M are not, they might get PG but if you take it to its logical conclusion the News should be M if not higher,I,m not sure what you would classify ACA and that other load of rubbish TT,NWW however that just me. News and current affairs are unclassified, but they still have to not be gratuitous. ACMA takes the view that classification / timezones is now a shared responsibility. With adequate info and parental lockouts you’re apparently in control. It will be interesting to see how this plays out. The only study I have seen on child lockout were that it wasn’t used much, but that was years ago when the technology was new. If you remember what the PIN was it’s hassled to type it in and turn it off or override every time you flick to an M rated show. So people tended not to bother with it on the lounge room TV. They just recorded anything not G or PG to watch after the kids have gone to bed and make sure something G or PG is on. It was used more on kids room TVs. But as many people don’t even change the default PIN on their voicemail, so it was commonly left at the default 0000 or 1234, or written down somewhere. In which case you can bet that the kids know how to switch it off. Many households just let kids watch all sorts of stuff. Even when I was a kid there were kids at school who boosted about seeing all the stuff the rest of us weren’t allowed to. You know in this day in age, a person can watch whatever they want with ease whenever they want (after the origanal airing) online. If you are really concerned about your kid staying up until 10pm to watch some Reno show which very few people are watching, then you can make your kids watch the next day at the very child friendly time of 4pm. Be a parent and have a say in what they watch instead of expecting others to do it for you. Yes! The voice of reason in this never ending insane and inane debate. Do you mean that Nine should keep a low rating show that is costing them advertising dollars in what you consider a child friendly slot in case some kids want to watch it? Repeats of Big Bang on 9 up against repeats of Big Bang on 7mate. First ep on Nine is new. I wonder what this means for The Block 2016. Looks like saturation has finally killed the golden goose. I didn’t watch Reno Rumble, But i Will be watching the Block. Maybe other people are like me?